My piece of the Bayeux tapestry at first glance doesn’t look like a very important piece. It is just men on horses followed by a few archers. But after studying this section of the Bayeux tapestry, I learned that it’s contents were actually a very important part of the story. This piece is of the Norman soldiers charging the English. The archers behind them are providing cover for the men charging on horses, archers usually were the last in the army. The archers wore much less armor than the cavalry men, if any at all. One thing i noticed about the archers were that their clothes were all different colors. They all had the same color scheme, but different items of clothing on them were different colors. One archer is covered in full armor like the men on the horses, but the rest were armor less. I found this odd because I am sure archers were just as likely to get hit by opposing arrows as cavalry men. Maybe they didn’t have enough armor to give to all the archers. Spears seemed to be the weapon of choice for the warriors charging on horses. 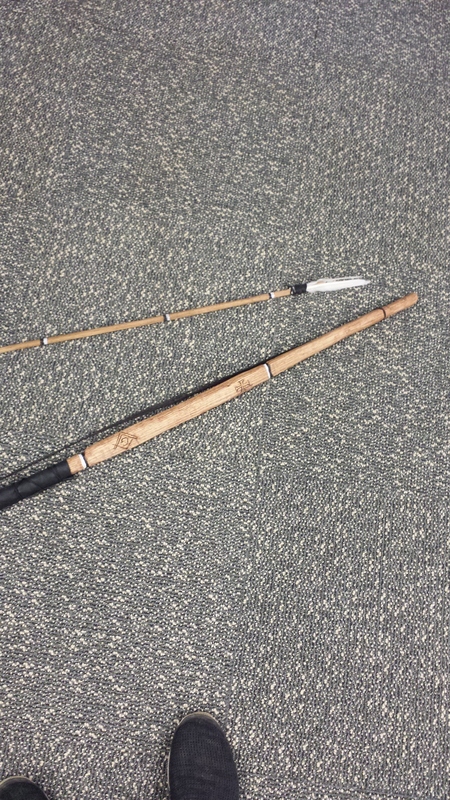 Spears were long and could stab people easily while riding by them, they could also throw the spears to try to hit further targets. Upon further research i found out that this piece is actually quite important, it is important because it is a transition piece. The horses in the pieces prior to my piece are walking and in my piece they move to a gallop. This is significant because the cavalry are increasing speed riding into battle.The caption of this plate is that the battle has begun. So even though this section of the tapestry might seem uneventful, it actually is quite the opposite, it is the start of the action. The bottom border of my piece contains animals, but in the next piece the bottom borders are filled with dead soldiers and mangled body parts. In the piece after, all of the dead English are seen with arrows sticking out of them, thanks to the archers in my piece most likely, this leads me to believe that in my piece they are still far away from the English. I don’t see any men dead from spears yet, so at this point there still must be some distance between the armies. Some more interesting things I found out about this piece were that the lower border and upper border contain animals that are thought to be fables. I am not sure what specific fables they are suppose to represent, because some of the animals are unidentifiable, still to this very day nobody knows what some of the animals are. The archers in piece 60 are the first Norman warriors that are seen on foot. In all the pieces before where the Normans are traveling or marching to war, all have been on horseback, pr ships. I thought this was a significant piece because it is the last piece before combat, the war starts in the section after my section. So piece 60 is a very important piece because it is a transition piece from non violence to violence. Transitioning is a very important aspect in art, and I think they transitioned well in this tapestry. The archers ready their arrows while behind the cavalry. 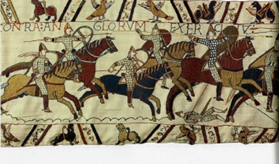 “Britain’s Bayeux Tapestry.” (2000-2004): n. page. <http://www.bayeuxtapestry.org.uk/&gt;. Hicks, Carola. The Bayeux Tapestry. London: Vintage, 2007. Print. Wilson , David. The Bayeux Tapestry. New York, New York: Thames and Hudson, 1985. Print. 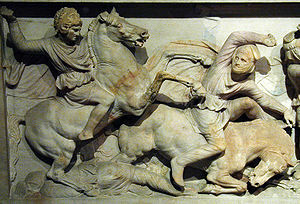 Alexander the Great is known for being one of the greatest army commanders of all time. There are many stories of the battles he won and how he won them. Alexander was often on the move. He had thousands of men that he constantly needed to move at one time. The terrain was often tough and dangerous, and he couldn’t afford to lose any men on the way to battle since he needed them to fight.These conditions often required a special kind of member of the army that is often overlooked in great armies. These members were scouts. Scouts were used for many reasons, all of which gave Alexander’s armies a great advantage over the enemy. One of the main jobs of a scout was to go ahead and survey the terrain. Quintus Curtius wrote, “ Then, as the scouts that had been sent ahead reported that all was safe, he sent on a few of the cavalry, to try to ford the river.” Terrain really does play a much bigger role in battles than we give it credit for. The river Curtius talks about easily could have swept away and killed Alexander’s troops as fast the incoming Persian army. Even now, there doesn’t seem to be that much written on the subject of Alexander’s scouts. Scouts aren’t as interesting of a subject as something like Berserkers or a general of an army, but they were just as important. If scouts weren’t utilized by Alexander, then the outcome of many battles would have been very different, such as the battle of Issus. Quintus Curtius wrote a lot about Alexander and Darius. He wrote, “They could hardly be believed ; therefore Alexander ordered scouts, sent ahead by sea to those regions, to find out whether Darius was coming in person, or whether some one of his generals had made believe that the whole army was on its way.” This is a good example of another way the scouts were utilized. In this case the scouts had one job: to go as fast as they can to see what was heading towards them. If the whole army was on its way, then Alexander would have to ready his army, but if Darius himself was coming, a more of a political discussion would take place. When scouts are thought of, this is often the job we think of them having. Getting military intel is something that is more valuable than any amount of men. Alexander knew this and that is why he used scouts so much. These are the two main scouting techniques that we have evidence of Alexander using: terrain scouting, and military scouting. Both of these scouting techniques probably saved the lives of countless soldiers in Alexander’s army. In my opinion, scouts are a big part of why Alexander was so successful. He knew how valuable they were, and he understood that the information they could obtain was very valuable. Scouting is still and will always be a huge part of military action. Alexander’s army contributed to the scouting ideas that we still use today.